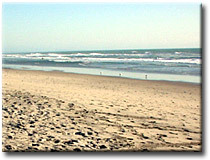 Beautiful Harbor Beach is Oceanside's largest beach. The Oceanside Harbor, adjacent to Harbor Beach, has many amenities including the Marina Inn Hotel and a variety of shops. In the harbor, you can sail, spend the day on a deep-sea fishing boat, whale watch, rent kayaks or visit the marina. Fishing is an option from the jetties. Harbor Beach is a beautiful venue that has something to offer everyone. There are a number of parking lots in the Harbor beach area. From Interstate 5, exit Harbor Drive, west Harbor Drive will take you directly to the entrance of the Harbor. 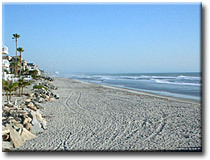 This is a quiet, family beach located just south of Oceanside Harbor. It is popular with surfers and volleyball players. 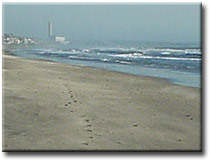 Surfers, however, will have to walk down to the jetty in the summer months when the beach is closed to surfing in front of Lifguard Tower 8. 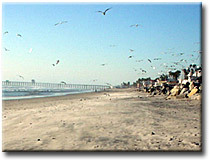 The river jetty is where the San Luis Rey River meets the ocean. A sandbar is often formed here and creates a good surf break. 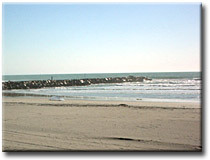 The area at the river mouth is usually one of Oceansides least populated beaches. This is partly because it is open for surfing only, and because its a bit of a walk from the parking areas. Children often like to play in the river mouth; this is not advised because it poses a safety concern due to the strong currents and the potential for high levels of bacteria in the river. A pay parking lot is located east of Pacific Street. There is also metered parking along Pacific Street. The pay parking lot will be on the east of Pacific Street. 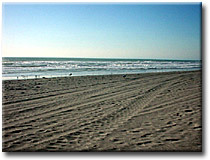 The beaches north of the Oceanside Pier have much more sand than those south of the pier and provide more space for those visiting the beach. Due to the Pier Amphitheater being situated on the south side of the pier, there are fewer activities and events that occur on the north side and the pier. This often makes for a quiet, more relaxed atmosphere. During the summer months, an area is closed to surfing (blackballed) but open for all other water activities. The surfing and swimming area will always be marked with checkered flags and swim-surf signs. 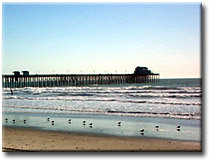 The Oceanside Beach Community Center is located just north of the pier on The Strand. Several programs and activities are held here throughout the year. One very small, pay parking lot, which usually fills up rather quickly in the summer, is located just north of the pier. Other pay parking lots are located on the corner of Mission Avenue and Myers Street, and on Surfrider Way, ½ block east of Pacific Street. 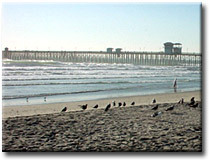 The beach area south of the Oceanside Pier is Oceansides most popular beach. If you dont mind crowds, you will be comfortable here. The pier itself is a beautiful walk and a popular fishing spot as well. Due to the number of beachgoers in this area, there are two lifeguard towers relatively close together. During the summer months, the area from Tower 1 south is closed to surfing most of the day. The area will be marked with a black ball flag as well as swim-surf signs and black-and-white checkered flags that indicate the boundaries. The surfing area is from Lifeguard Tower 1 to 100 feet from the pier and is closed to all other water activities. No water activity is allowed within 100 feet of the pier. It is easy to determine the 100-foot line by looking to the shore and locating two black and yellow signs. The 100-foot rule is a safety precaution and is a strictly enforced City ordinance. The pier itself offers fishing, a bait shop, payphones and restrooms. At the end of the pier is the 50s diner, Rubys. The nearest parking lot is located one block east of Pacific Street and one block north of Tyson Street on the corner of Mission Avenue and Myers Street. There are also two available handicapped parking spaces on The Strand. Wisconsin Street beach is located at Wisconsin Street and The Strand. The south strand is a one-way, southbound street that parallels the beach. There is a ramp just north of the lifeguard Tower 7 for access to the beach. This is Oceansides least frequented beach due to the beach being narrow. When the tide is high, the water often comes all the way up to the rocks, leaving very little or no beach at all. The ocean in this area is open to all water activities. Oceanside Boulevard beach offers more actual beach area than its neighbor, Buccaneer Beach. All along the beachfront, there are private homes facing the ocean. During the summer months there is an area directly in front of the lifeguard tower (Tower 9), approximately 200 ft., that is designated for swimmers, waders and body boarders only. For safety precautions, this area is closed to surfing and will be marked by checkered flags and swim-surf signs. There is a very large rock that sits in the surfline approximately 300 feet south of the lifeguard tower and can be seen at low tide. Buccaneer Beach is Oceanside's smallest beach with a lifeguard tower (Tower 11); however, the beach offers other activities due to the park located across the street. During the summer months, the water directly in front of the lifeguard tower and between the rocks that border the neighboring homes is designated for swimmers, waders and body boarders only. As a safety precaution, this area is closed to surfing and is marked by two checkered flags and swim-surf signs. The area outside of the flags is open to surfing and to all other types of water activity. GLASS: All glass containers are prohibited. FIRE RINGS: Fires are allowed in designated City fire rings ONLY. No fires are allowed from 11:00 p.m. to 6:00 a.m. daily. There is no curfew on fire rings at Harbor Beach. All wood must be no longer than 30 inches in length and must not be allowed to rise above the height of the fire ring more than 2 feet. You must attend your fire at all times. Any unattended wood will be removed and disposed of. No chemically treated wood is allowed. The use of pallets is forbidden. Do not cut or break apart wood on the beach, street, walkways, or parking areas. When finished, extinguish embers or fires with WATER ONLY  NOT SAND! If you wish to bring your own barbecue, it must be elevated off the ground. Coals must be removed or disposed of in the hot-coal container located at Tyson Street Park, or Harbor Lot 12 on Harbor Beach, or in a fire ring. SWIMMING and SURFING AREAS: All swimming and body boarding areas are marked with a black-and-white checkered flag. If you wish to surf with a hard surfboard you must be outside of this area. A yellow flag with a black dot identifies a swimming-only area. CAMPING: Overnight camping is allowed in the Harbor Beach area in Lot 12. PICNIC AREAS: All picnic areas and fire rings are first-come, first-served. You cannot hold your spot with a "Beach Chair"; there must a person standing there. LOADING and UNLOADING: Parking your car on the strand is prohibited at all times. If you wish to load and unload your vehicle, you may use a turnaround, such as the one at "Surfrider" and The Strand.